Need a new super easy, midweek crowd-pleaser? 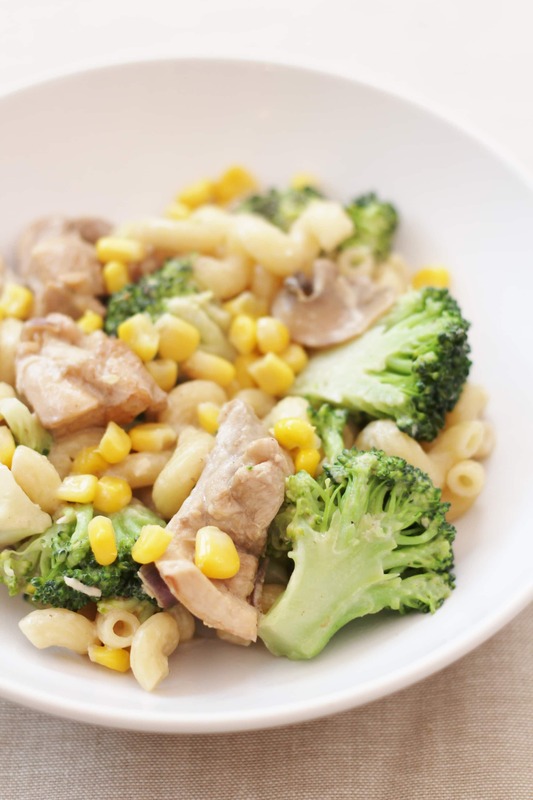 I have the answer: Creamy Chicken, Broccoli and Sweetcorn pasta – simple, delicious and ready under 30 minutes – what’s not to like? As you know, I love a good traybake or slow cooked stew, but some days I just don’t have an hour for a traybake to cook or a 3 hour window to allow my beef chilli to slowly chunter away in the oven…often I need a meal on the table within the next 30 minutes. Like most modern families, life in the Gargano household is BUSY – the kids do loads of clubs and have a social diary that is far more exciting than mine, I have a million and one things to do on my blog…not to mention the housework, the school paperwork (!) etc. etc. Sometimes I just need a meal that I can have on the table quickly and that I know everyone will like! 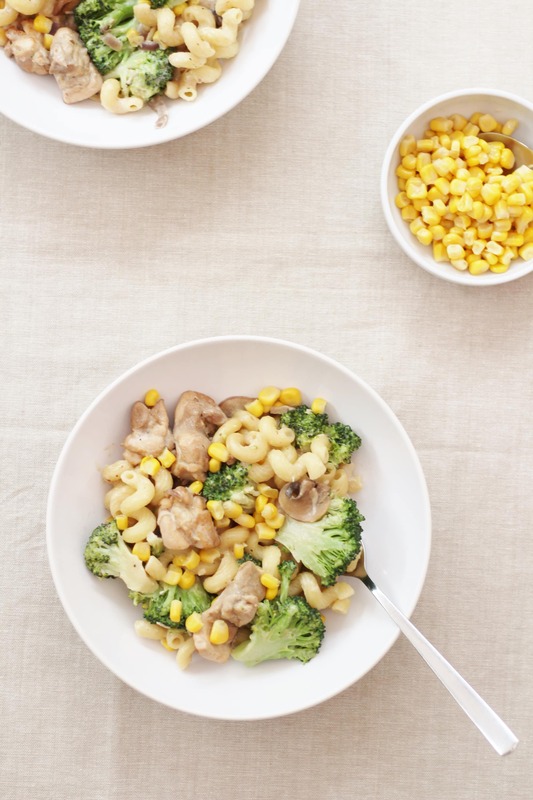 And this was the inspiration for today’s recipe: Creamy Chicken, Broccoli and Sweetcorn Pasta. 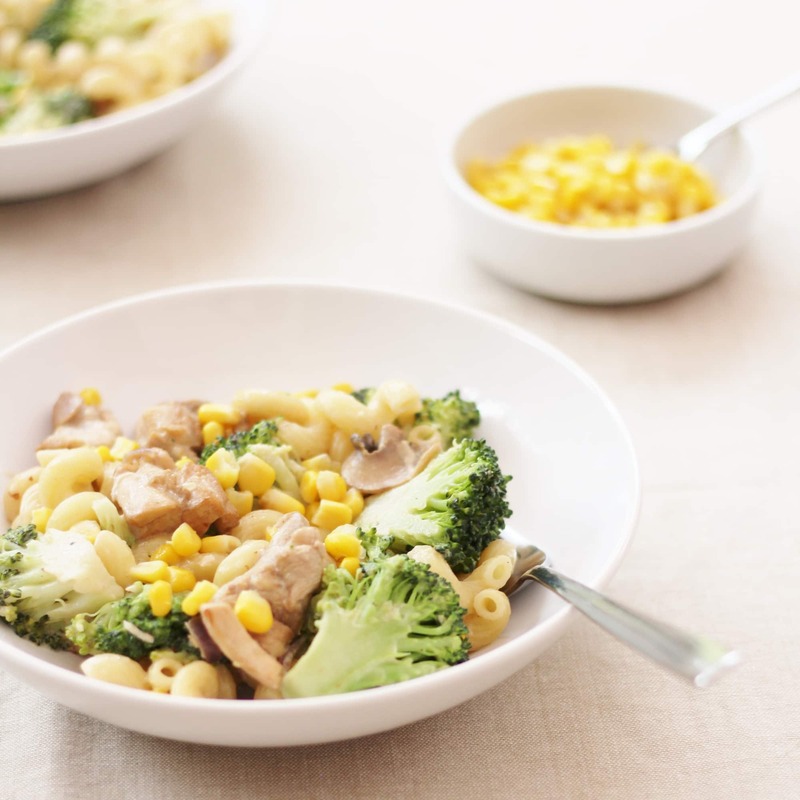 This meal is really simple to make, fry up some chicken and mushrooms, boil some pasta and broccoli and throw it all together with some crème fraiche and sweetcorn – DONE, and in well under 30 minutes – more like 20 if I get my skates on! Plus it’s a real crowd-pleaser – my kids wolfed it down when I made it for them (not to mention Mr G! ), it’s really easy to adapt too. It would work brilliantly with turkey, tuna or salmon. You could make it veggie, by adding in a tin of kidney beans or chickpeas instead of the chicken – alternatively Quorn chicken would work well here too. 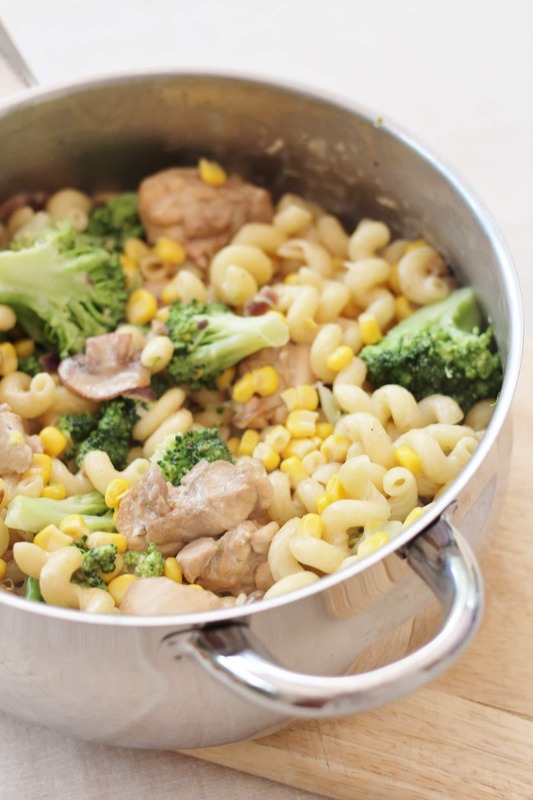 And you can vary the veggies according to what’s in the fridge, or what your kids (or other half!) will eat: red peppers, green beans, peas or spinach would all work well in this very flexible recipe. I used fresh veg, but to make this super speedy you could use frozen mixed veg. Finally if you really want to make life easy for yourself you could make a double quantity of this simple pasta dish and have it the next day sprinkled with cheese and breadcrumbs and cooked in the oven as a pasta bake, with a crisp green salad. An easy crowd-pleaser of a dinner deserves an easy crowd-pleaser of a wine, so go for an unoaked Chilean Chardonnay, which would make a fab match. Place the olive oil and sliced onion in a wide, deep saucepan and fry gently for 3 minutes with the lid on. Turn the heat up and add the mushrooms and chicken pieces. Fry for a further 3 minutes to brown everything a little. Add the garlic and fry gently for 30 seconds, then add the crème fraiche and bring to the boil. 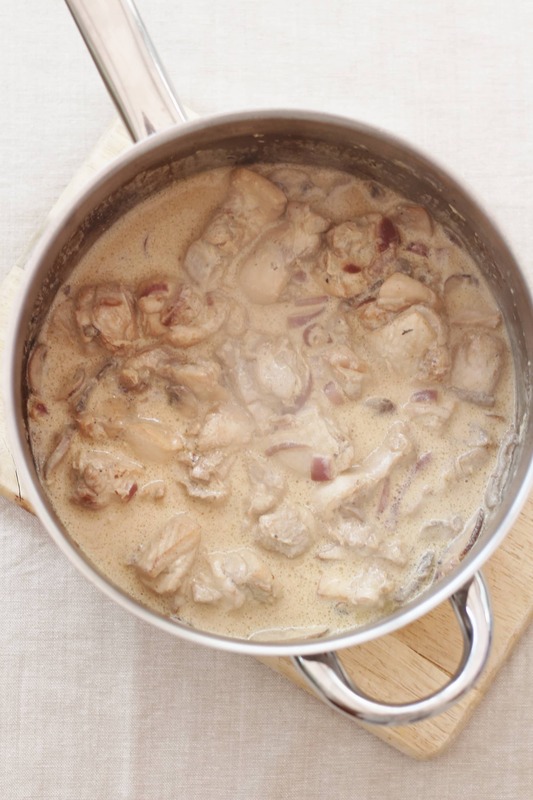 Turn the heat down and allow the sauce to simmer gently for 7-10 minutes until the chicken is properly cooked through. Meanwhile cook the pasta according to packet instructions / your own personal preferences. 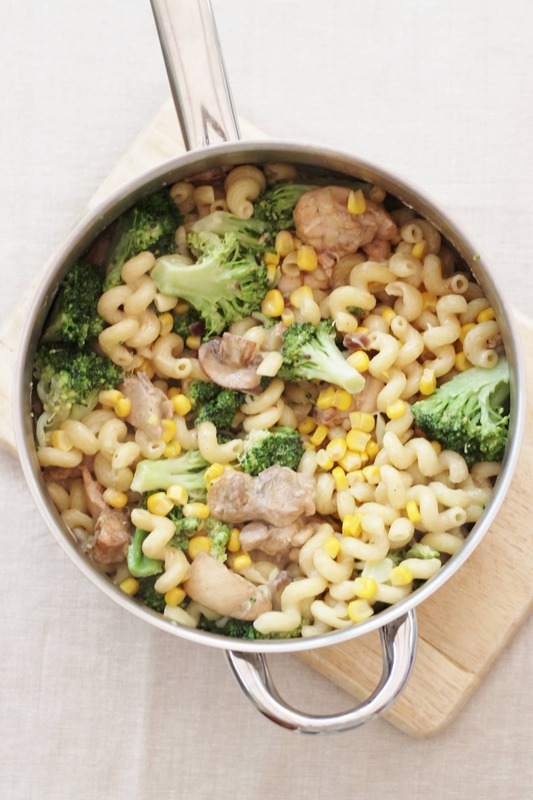 3 minutes before the pasta is cooked, add the broccoli florets to the pasta water. When the pasta and broccoli is done, drain and add to the crème fraiche sauce. Add in the sweetcorn, salt and pepper. Stir everything together and serve. To turn this into a pasta bake the next day, put the pasta and sauce in an ovenproof dish and sprinkle over some cheddar cheese and breadcrumbs – bake at 180C for about 30 minutes or until brown on the top and bubbling. Such an easy meal. I love pasta and would make it all the time except one of my children completely refuses to eat it! I keep hoping to convince her one day as this is just the type of meal the rest of us would love! Thank you so much for sharing with #CookOnceEatTwice.